North West Bicester eco-town is set to become one of four towns in the UK designed according to the highest sustainability standards in the country. The eco-town will include 6,000 highly energy efficient new homes, onsite energy generation, efficient public transport links, bike lanes, schools and various community and recreational facilities. Its first phase, known as the Exemplar, already broke ground and the first residents are expected to move into 393 zero carbon homes later this year. The next stage, which includes the construction of another 2,600 homes, has been recently approved. The master plan of the North West Bicester eco-community, “UK’s most sustainable development”, has been proposed by the UK-based shared ownership and affordable housing organization A2Dominion. Construction began on the first homes as part of the initial Exemplar phase of the project. The zero carbon homes, some of which will be affordable, are using the latest green technologies, including solar power harvesting, rainwater collection and energy monitoring systems. All homes will be built to meet the code level 4 requirements for Sustainable Homes and BREEAM excellence. According to the original One Planet scheme, around 40% of the eco-town master plan will be dedicated to parks and green areas, including a nature reserve and country park. Bicycle lanes, footpaths and public transport will be an integral part of the scheme. Schools will be located within walking distance from all homes, while jobs created will be within sustainable travel distance. The infrastructure will include charging points for electric vehicles and an electric car club. The first phase, Exemplar, is close to completion and includes the construction of 393 zero carbon homes, 119 of which are affordable homes for rent or shared ownership. An area of over 17500 square meters will be covered with solar panels and around 40 percent of land will be devoted to preserving wildlife and biodiversity. 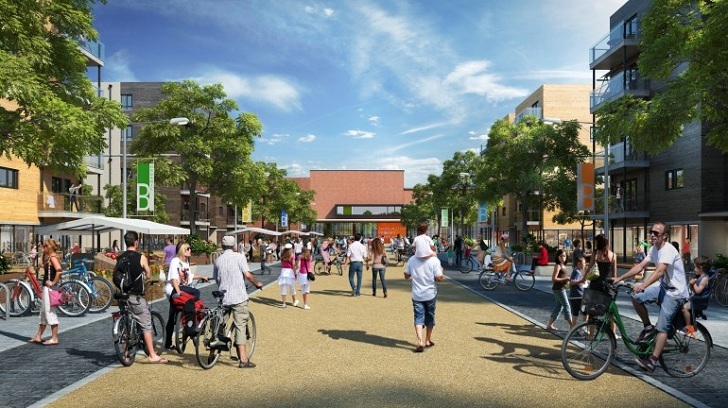 The master plan of the North West Bicester eco-city, "UK's most sustainable development", has been proposed by a UK-based shared ownership and affordable housing organization A2Dominion, which began constructio on the first homes, part of the initial Exemplar phase of the project. The zero carbon homes, some of which will be affordable, are using the latest green technologies, including solar power harvesting, rainwater collection and energy monitoring systems. All homes will be built to meet the code level 4 requirements for Sustainable Homess and BREEAM excellence. According to the original One Planet scheme, around 40% of the eco-town master plan will be dedicated to parks and green areas, including a nature reserve and country park. Bicycle lans, footpaths and public transport will be an integral part of the scheme. The first phase, Exemplar, is close to completion and includes the construction of 393 zero carbon homes, 119 of which are affordable homes for rent or shared ownership.